Found one file extension association related to WebShop Platinum and 1 file format developed specifically for use with WebShop Platinum. 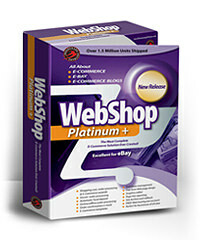 WebS Shop Platinum is a web authoring software. Create an E-Commerce Web site in no time, without technical training. Make your Web design experience easy. WebShop Platinum Plus offers everything you need: a fully featured Site Manager, WebStore Templates, Database Import Wizards, HTML Themes and Styles, Thumbnail Photo Viewer, Free-Form Page Design, and more. Easy to use, it features all the sophistication you need. Delete/Cleanup Unused file Resources that are not used by the site and take up extra space. Taxation options for various countries and states/provinces. Images for the product can be uploaded directly from Admin pages using browser. View / edit visitors basket, customers basket, delete orders. Multiple level of product categories (up to 5 levels). The WebShop Platinum software seems to be old or discontinued. If you need more information please contact the developers of WebShop Platinum (Bloomerang Software, Inc.), or check out their product website.